DETROIT (Bloomberg) -- Ford Motor Co. has bigger aspirations than challenging Toyota Motor Corp.'s Camry. Its Fusion is about to take on the law of supply and demand. An assembly plant about 20 miles south of Ford headquarters in suburban Detroit is preparing to roll Fusion family cars off the line for the first time. The additional supply will test the staying power of a more than $2,300 per-sale premium that Fusion has commanded this year over America’s longtime best-selling car, the Camry. The Fusion is Ford’s best shot at eventually reclaiming the car-sales crown it last held in the 1990s heyday of the Taurus, a model CEO Alan Mulally studied at Boeing Co. The Fusion’s sale surge -- 13 percent so far this year -- has cut a quarter of Camry’s sales lead, demonstrated how much consumers care about attractive design and illustrates how U.S. carmakers can now compete in all segments. It has also overwhelmed capacity at the only plant where it has been made, in Hermosillo, Mexico, which couldn’t make more than about 350,000 Fusions and Lincoln MKZ sedans. The Mustang assembly plant in Flat Rock, Mich., hired 1,400 employees to produce as many as 100,000 more Fusions. The added output draws Ford closer to production levels that Toyota and Honda Motor Co. reach with their Camry and Accord. It also positions the No. 2 U.S. automaker to continue growing in coastal states that were long a source of weakness. The average price that the Fusion has sold for this year through July climbed 5.8 percent to $26,343, behind only Volkswagen AG’s Passat in the mid-size car segment, according to Kelley Blue Book. Fusions are selling at a premium of $1,176 above the segment average and $2,378 over the Toyota Camry, which ranked No. 11 in segment pricing this year, behind entries such as Chrysler Group LLC’s 200 sedan, said the researcher, which includes some incentives in its analysis. Camry’s average prices have fallen 2 percent to $23,965, and the car has slipped from ranking eighth in the segment at this point last year. Another selling point has been Fusion’s fuel economy, said Baum, whose research on electric and plug-in vehicles was used by the Obama administration to set U.S. green car sales goals. Ford is offering Fusions powered by a standard gasoline engine, three turbocharged EcoBoosts, hybrid and plug-in hybrid powertrains -- everything but all-electric, Baum said. The range of options has enabled Ford to generate interest by marketing the 47 miles per gallon highway fuel economy rating for Fusion hybrid, even though the bulk of sales are the traditional gasoline-engine model rated 34 mpg highway. Improved fuel economy for the redesigned Fusion sedan and Escape SUV as well as efficient new models such as the C-Max hybrid are fueling Ford’s growth in California, a state that has given American carmakers fits for years. The Ford brand’s 18 percent jump in California light-vehicle sales during the year’s first half put the marque within 0.1 percentage point of the Honda brand’s market share, according to the California New Car Dealers Association. Ford is training new workers at its assembly plant in Flat Rock to help boost inventory in markets such as Los Angeles, San Francisco and Miami. While Ford had about 40 days supply of Fusion across the country at the beginning of this month, the carmaker carried enough stock to last 30 days in those markets, said Erich Merkle, its U.S. sales analyst. “Ford spent a lot of money on the vehicle, it’s gotten really good reviews, it looks really nice, and you want to be able to make as many as you can now,” said Adam Jonas, an auto analyst for Morgan Stanley. Even with its looks, prices will probably come down some as Ford accelerates Fusion production, because the earliest models were loaded with content and the extra output may be of lower-priced versions, Jonas said in a telephone interview. 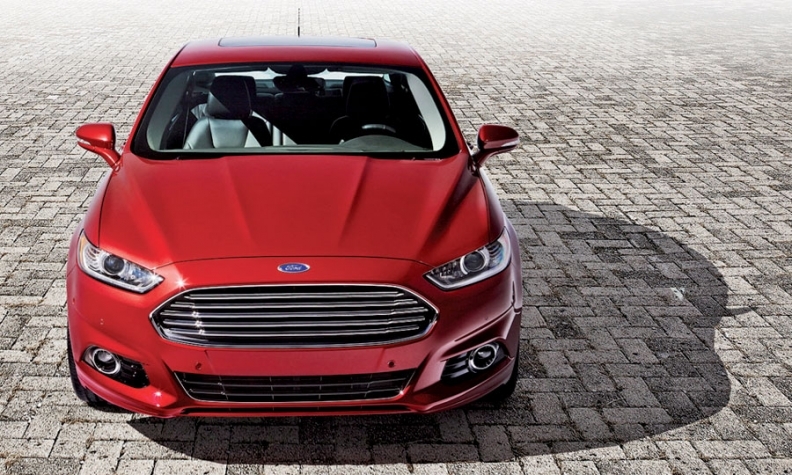 The automaker has said it’s on track to increase Fusion production this quarter. The Fusion has prompted Toyota to acknowledge the challenge it faces to maintain leadership for its Camry sedan, which has reigned as the top-selling U.S. passenger car for 11 years and 15 of the last 16. The additional production from Flat Rock could allow Ford to stretch for as much as 450,000 units of combined annual Fusion output from the Michigan factory and its Hermosillo plant in Mexico, said Jeff Schuster, an analyst for LMC Automotive. The researcher estimates that Toyota has capacity in North America to build about 475,000 Camrys per year, while Honda can assemble about 450,000 Accords. LMC forecasts Ford making about 350,000 to 360,000 Fusions this year, Schuster said.